I love working in a profession where my number-one job is to make a person feel better about themselves, and make them healthier at the same time. It has been my goal over the past 20 years to work with patients on a personal level and help them understand and see the benefits of orthodontic treatment. It can make wonderful changes in people’s lives! The diversity of the patients we see makes this such a wonderful profession as well. We work with young patients to help them with problems that can adversely affect their growth; teenage patients to help them solve problems that help to raise their self-esteem and give them better health in the future, and adult patients to help correct problems that they have always wanted to address, or problems that have recently come up. It gives me great joy to see the positive impact that we have on people’s lives. My team and I truly have our patients’ best interests at heart. We respect our patients’ feelings, time, and point of view. Everything we do is for the benefit of our patients, from being encouraging and patient, to listening to all of a patient’s concerns, to celebrating together once treatment is finally complete. As a dentist and orthodontist, I feel I can best help patients by having the latest information and understanding the latest technology to give them the most up-to-date treatments available. I spend a lot of time on general dental continuing education (as well as orthodontic continuing education) because I feel it is important to be able to communicate with a patients dentist so that we can work together seamlessly to give a patient the latest and best available therapies. I really enjoy all the aspects of the field of dentistry, and while my field is limited to orthodontics, having the opportunity to experience all the types of dental continuing education is truly a blessing to me. I feel it benefits our patients tremendously when our focus can be their overall dental health. I love being part of organized dentistry because it is a profession that continues to excel at advancing effectiveness of treatment. It is one of the few areas in healthcare that continues to become more patient-centered over time. I enjoy working with my peers to continue to advance the study and practice of orthodontics for generations to come. The Aiken area is a wonderful community in which I have had the opportunity to live most of my life. I can think of no better environment in which to live and raise a family. My wife Lisa and I have been married for 20 years. 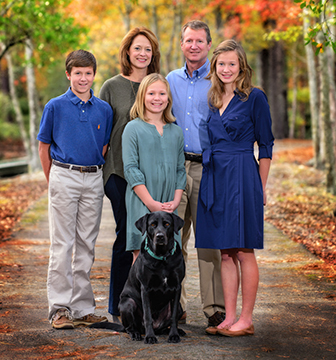 We have three children, Elizabeth, Wes, and Rosie, and a black lab named Dixie. With three active kids, my free time is usually spent at one of their sporting events, though I do make time for hunting, fishing, and spending quality time with my wife.